Spook Country is a strange book, in that I enjoyed it despite the fact I never felt much of a sense of danger or nail-biting suspense. The fate of the world isn't exactly at stake. Mom and apple pie are not really threatened in any meaningful way. In the end it feels like much ado about nothing. But I gleaned some real pleasure from the treatment Gibson gives his characters here, many of whom literally stumble into the plot's unfolding drama and have to figure out what's going on by the seat of their pants. The book's title promises all manner of spy-vs-spy goodness, but that isn't really what we get. Nor does Gibson have much new to say about the way in which the world has changed — its political and moral landscapes — in the years after 9/11. It's an entertaining yarn, but by Gibson's standards, one that feels featherweight. Given its subject matter, you'd expect it to have a greater sense of consequence. 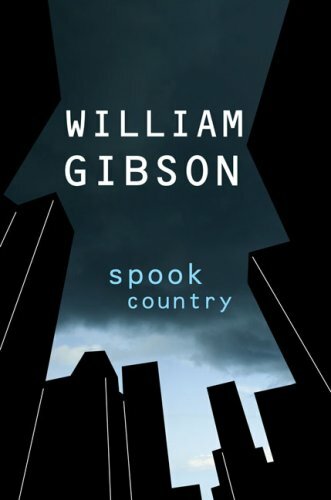 As he's done before, Gibson brings together disparate groups of people with conflicting agendas, whose multiple narrative threads are tied together strand by strand as the tale progresses. He pulls it off here with much greater clarity than in, say, Mona Lisa Overdrive. Some of his players have backgrounds in intelligence and counter-intelligence, and are motivated by powerful moral imperatives. Others are complete dilletantes. 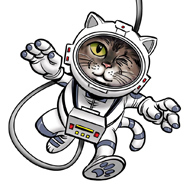 (As one puts it almost flippantly, "Secrets are cool.") One character is the story's requisite thug, but you get the impression he's a complete poser. But — and this is key — no one is operating in any kind of official capacity, either in law enforcement or on behalf of any government or military body (with one possible exception, and we never learn who he's working for at all). Everyone's in it either for personal reasons, or because they've been forced into it. It's perhaps the most colorful rogue's gallery Gibson's imagined since the heady days of the Sprawl. The story begins when Hollis Henry, a young woman formerly in a cult indie rock band who's now freelancing as a journalist, is commissioned by some startup Eurotrash mag to do a piece on a growing art trend in LA. (This "locative" art, involving VR helmets and GPS gizmos to create virtual art installations in real locations that you can't see without the proper equipment, is actually a stroke of genius as SFnal concepts go. It's so compelling and convincing in the book that I decided to Google it to see if it's something people are actually doing. Apparently, it is, though not yet quite at the scale Gibson envisions.) It turns out that what Hollis's tycoon employer is really after is one specific individual who's a key figure, through no fault of his own, in some shady business involving a missing mystery package, a shipping canister that's also sought by a small-time crime family in New York with loose ties to Castro and the old KGB, a former CIA man gone rogue, and others whose origins are far more nebulous. What's in the package? WMD's? Drugs? How could it have gone missing? Who's it for? Where is it now? If the resolution to the whole thing seems disappointingly trivial, I never got the impression the resolution was Gibson's point. For the most part, the missing canister is a traditional Hitchcock McGuffin (though Gibson does eventually tell us what's in it). Mainly Gibson's goal is to examine the secret world beneath the surface of the one we inhabit daily. It's overtly symbolized here by the locative art; travel to a specific destination labeled on your GPS tracker, pop on your VR goggles, and you'll see something that isn't there. Likewise, all around us, wheels are being turned, economies and governments influenced by powerful people whom we never see, or whom we may see while remaining blissfully unaware of what they're actually up to. One clever stroke is the way Gibson has characters using today's most ubiquitous tech toy, the iPod, to pass along secret coded information. If there were a better way to hide in plain sight in this day and age, I can't think of it. Ultimately, though, Spook Country amounts to little more than thinking-person's escapism. You keep expecting something profound to be said about The State of Things in our post-9/11, post-Iraq world, but the book never does so. 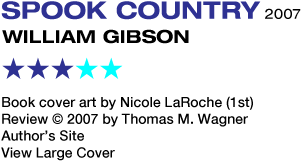 Yet as a page-turner, Gibson executes the book with panache. The mature Gibson is far less inclined towards the stylistic indulgences of his earlier work. But those indulgences did make his name, and longtime fans who were disappointed in Pattern Recognition because they felt it lacked that Gibsonian edge might feel let down by this one too. I admired the lucidity of Gibson's uncluttered prose, which still shows a gift for inspired and witty turns of phrase. But I also can't get around the feeling the story ought to have amounted to more than it does. Gibson's cyberpunk in the 80's made readers think, and Spook Country — which could have had a lot to say about the notion of a surveillance society and governments that overstep their bounds and step on civil liberties in the name of security and fighting terrorism — doesn't.